The war between two BJP ministers one in the state and the other centre escalated with Maneka Gandhi asking Maharashtra Chief Minister Devendra Fadnavis to remove his forest minister for having ordered the killing of Avni the tigress. Hyderabadi sharpshooter Nawab Shafat Ali Khan also confirmed his team had acted on the orders of the Maharashtra government. Union Women and Child Development Minister Maneka Gandhi on Tuesday wrote to Maharashtra Chief Minister Devendra Fadnavis urging him to remove Forests and Environment Minister Sudhir Mugantiwar from the position. “I request you to fix the responsibility for the illegal killing of the tigress and consider removing Mugantiwar from the responsibility of the Ministry of Environment and Forest in the state government. I have personally known you an animal welfare person and I am sure you will consider my request,” Maneka wrote in the letter. 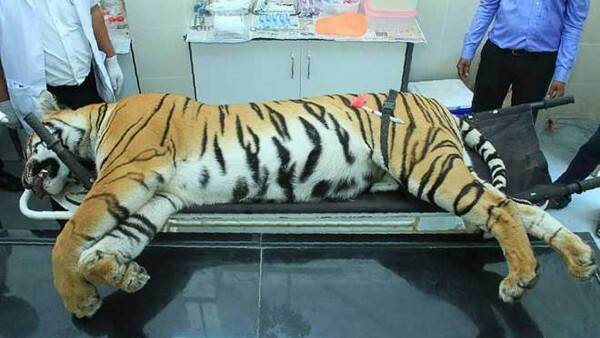 The minister also stated that she had been in talks with Mugantiwar for the past two months and had repeatedly requested him to ensure that the tigeress was tranquilized and quarantined. “But for some inexplicable reasons, Mugantiwar has been repeatedly calling Shafat Ali Khan to kill the animals in Maharashtra. As ministers, we need to exhibit the highest standard of sensitivity to the constituencies that we serve,” she added. Avni was a five-year-old tigress identified as T1 who had caused widespread fear in Maharashtra’s Vidarbha forests. She was shot dead early on Saturday near Borati village in Yavatmal district. Maneka earlier had hit out at the minister on Sunday saying that it is a “straight case of crime” and said that Mugantiwar had earlier directed killing a dozen of leopards and 300 wild boars. “I am shocked that such a person is continuing to hold a ministerial position. Every time he has used the Hyderabad shooter, Shafat Ali Khan, and this time his son has also appeared on the scene to kill the tigress. His son was not authorized to kill. This is patently illegal,” she added. As per Supreme Court directives, forest department officials are required to first tranquilize and trap such an animal, but in Saturday’s operation, Avni allegedly attacked the stalking team which shot her. Under attack from animal rights activists for killing Avni, Hyderabadi sharpshooter Nawab Shafat Ali Khan said his team had acted on the orders of the Maharashtra government. Shafat Ali Khan, whose son Asghar Ali Khan killed the tigress, defended their action saying the bullet was fired in self-defence. Avni, identified as T1 and held responsible for killing at least 13 humans, was shot dead in Maharashtra’s Yavatmal district on Saturday. Shafat lashed out at the activists, including Union Minister Maneka Gandhi, for making personal and baseless allegations against them. He threatened to sue those indulging in mudslinging. “We have legal recourse to take. We will not keep quiet,” he told reporters here. He said he was not scared of such allegations, and would continue to stand by those whose lives were threatened by elephants and tigers venturing out of forests. “Whenever governments or poor Indians call me, I will go to help them. The Constitution of India has given the Right to Life to all citizens. If a tiger or an elephant comes out of a jungle and kills people, I will stand by those people,” he said. “Why those making allegations now did not have the guts to go there. Why no police officer or military general was called. Was there nobody else in the whole country,” he asked. Shafat said he had been called by the Jharkhand government to kill an elephant that was held responsible for the death of 15 people. Last year, he was called by the Maharashtra government to kill a leopard that had mauled seven children to death. “Now after spending 40 days in the (Yavatmal) jungle and facing all difficulties, we completed this operation and they are making all sorts of allegations,” he said. On Maneka Gandhi’s allegation that Asghar Ali had appeared on the scene illegally to murder the tigress, Shafat said that his son was part of a five-member team authorised by the Chief Conservator of Forest(CCF), Yavatmal. Asghar said that their intention was not to kill the animal and that’s why they patrolled for 24 hours, taking risks on several occasions.